This scrub is popular with mechanics to remove grease and grime from hard working hands. The pumice powder provides the grit needed to loosen car grease from the creases of hands. The soap and foaming bath whip provide a bubbly lather that then removes this loosened dirt. For an added bonus the aloe vera oil acts as a softening agent to provide some moisture back to those dry-cracked hands. Its scented with Oakmoss Sandalwood Fragrance Oil, which is an appealing scent for men. You Save $8.75 by purchasing this kit rather than buying the items separately. Pumice, Sorbitol, Propylene Glycol, Glycerin, Water, Sodium Laureth Sulfate, Sodium Cocoyl Isethionate, Stearic Acid, Lauric Acid, Sodium Hydroxide, Palm Kernel Oil, Sodium Chloride, Aloe Vera Oil, Fragrance, Diazolidinyl Urea, Iodopropynyl Butylcarbamate. COMMENTS: Eliminates grime, smells handsome and leaves skin soft. Next time I may add more fragrance but other than that, customers love that there is something they can use that doesn't trash their hands. • easy to make and smells great!! COMMENTS: LOVED this scrub - takes EVERYTHING off - dirt, paint, grease, all of it! Made 5 different fragrances (some for ladies ) and can't keep it in stock. COMMENTS: I did like this kit. My soap seemed to cool rapidly, so I had some tiny lumps of soap in the final product, which I would like to eliminate next time I try the recipe. It did produce a nice amount of product. LOVE the jars that came with this, so much so, I had to order them to keep on hand. Pumice and my hands do not get along, so I'm not sure how well this will work for those with sensitive skin or soft skin. Scent was light. I did sub out the aloe oil for grapeseed, as I prefer it. COMMENTS: Smells amazing, and works great! "Nice addition to my men's line"
COMMENTS: 1st: the oak-moss sandalwood FO is my new favorite masculine scent & that now makes 4 favorites for men from WSP!! Loved this kit, once it was packaged, labeled & put on shelf, it sold itself. I closed the containers with black electrician tape, same as most products are now sealed with for shipment, & customers thought it was part of the whole packaging look...lol. Great job with this one, WSP!! COMMENTS: Several mechanics and gardeners among family and friends and they LOVED this scrub!! Will definitely be making more! COMMENTS: I will definitely be adding this to my new mens line. I have been asked to change the fragrance so I will be ordering the ingredients individually to accommodate. COMMENTS: This takes the grease off my husband's hands very easily and leaves them smelling amazing! Even he loves the scent and how soft his hands feel after using it. "Rave Reviews from my customers! " COMMENTS: This product has been a top seller not only for mechanics, but for gardeners. The scent is a masculine scent, but if you use a more herbal scent, its perfect for women. I think the original scent is unisex. I have one customer who purchases 10 at a time! • Larger quantity, double size the kit? COMMENTS: The Oakmoss Sandalwood FO in this is great. Guys love this and I also use it. It can be marketed to not just mechanics but other industries where hands get dirty. Be careful using the M&P base. You really need to ensure that it is completely melted so it doesn't get chunky when it cools while mixing. COMMENTS: My husband just loves this scrub. He is a mechanic, and has always use the brands sold at auto stores. His hands are always rough. Not only does this does the job helping clean his hand, but I have noticed a difference that his hands are getting softer. He loves the smell, this is definite keeper. COMMENTS: This kit has been approved by my resident mechanic (my husband). He said that it is even better than the scrub soap at the shop where he works and removes grease and grime easily. I love, love, LOVE the fragrance oil that came with it. I will definitely be ordering another kit! COMMENTS: Directions were very easy as was the time to make it. Love this scrub as so many of my customers do. May be ordering another in a month or two! COMMENTS: This kit was easy to make, smells wonderful and the scrub works!! This is a wonderful addition to my line. COMMENTS: This scrub reminds me of wet sand consistency. It isn't too heavy and the scent is nice enough. We promote it in our men's line for mechanics, roughnecks and anyone that uses their hands! COMMENTS: This product lives up to it's name. I do a lot of gardening and our dirt is almost black. clean up is a breeze with this scrub. This is a must have in my home. And I love the smell! COMMENTS: Works good for getting grease off. My boss's brother is a truck driver & he loves it. COMMENTS: Just received this kit and couldn't wait to make it. It is awesome. Easy to make and even easier to sell. Many of my local men are mechanics and their wives are the gardeners, so it's an easy product for me to sell. A bonus for leaving their hands nice and soft too. I love trying the kits first. It lets me determine if it will sell to my customer base without spending to much out-of-pocket. • Easy to make. Leaves hands very soft. COMMENTS: I purchased this kit to make Christmas presents for my dad and a few mechanic friends. They all LOVED it. My dad said it works better then the store bought scrub. I will definitely be buying more! COMMENTS: I love the fragrance and it was easy to make. My husband loves the exfoliant properties, the lather and that after he washes his hands, they feel moisturized. If you need a really strong exfoliant, this is it. COMMENTS: When I made the mechanic's scrub, I was surprised at how easy it was to make. I've used the scrub several times already to clean my hands after working in the garden, and it does a fantastic job. Not only did it clean my hands -- it left them soft as well. I'll definitely keep this product on hand year round. "Leaves hands clean and soft"
COMMENTS: I bought this kit with the intention of only making it once for my cousin who is a mechanic. I didn't think it would work so well! He loved it so I decided to keep it around. It's become so popular that I've had to start using 16 oz jars to put it in. Not only do mechanics love it, but so do gardeners, painters, and chefs. "Do you think using your gallon or half gallon jugs with the 38/400 pump to match would work with the scrub? " Staff Answer This scrub is extremely thick and will not work with any type of pump. "Do you think this scrub would work if I packaged it in the Malibu tottle bottles? " Staff Answer This is an extremely thick scrub and would not work well in a malibu tube. "I don't see a preservative listed, does this product need one? If so which one do you recommend? Also would the addition of preservative extend the shelf life? " Staff Answer This recipe already has the preservative in the foaming bath whip. You should be set as it does not need additional preservative. "Has anyone used this for a foot scrub rather than a mechanic's scrub? Was wondering how this would work for the feet." Staff Answer For a good foot scrub you need a medium grain Exfoliant and ingredients that add moisture. Our Mechanics scrub contains both. While the pumice powder in this recipe is a finer grain, it is very abrasive and works very well to remove rough dead skin. The Aloe Vera Oil in this recipe is a wonderful moisturizing oil that softens the skin. The combination results in smooth soft skin no matter what part of the body it is used on. "Why do you recommend selling these at $9.95? If I buy everything separately, do you still recommend selling at $9.95?" "Yes I was wondering how would you calculate the amount of preservative for a item like this? Would Germaben II be fine? Thanks "
The preservative you choose will have the percent to use per the total base weight (oz). Just be sure to check if it will work with the PH and oil content of your base. "What is the shelf life of your scrubs?" The shelf life for the foaming bath whip in this product is 1 year from date of purchase. So the shelf life for this scrub is 1 year from date of purchase. "Does this kit come with clear jars and black lids (as listed) or with an amber-colored jar (as pictured)? Thanks! " Staff Answer The Mechanics Scrub Kit comes with 8 Clear Heavy Wall Jars 89/400. And 8 Black Ribbed Top Cap, 89/400.Not the amber Jar that is pictured. Have a great day! "I have been able to thin this product with just a few oz of water. Should I ad a preserative or something to it at this point? Any recomendations apprectiated. Thanks"
Staff Answer Yes, a preservative should be added to any product that has water added to it. We would recommend either Optiphen Plus, Germall Plus, or Germaben II. "This is a really great Product, just have a couple questions. One is what can I do to thin it out a little so it could go in a hand pump container as it works great as a scoop use item but I would rather have it in a pump. Secondly can this product be warmer up so easier to pour into jars and bottles as opposed to using spoon? Thanks EB"
Staff Answer We do not recommend that the lotion pumps be used for this product as the pumice powder may clog the pump. An airless pump or squeeze bottle may be a better option and would be less likely to clog. 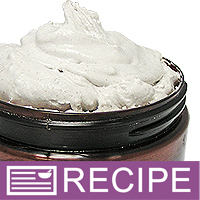 To thin the scrub, you could try adding less MP Soap Base, more Foaming Bath Whip, and more Glycerin. We have not tested this to know what percentages to increase these ingredients to and what the results would be so this would require testing on your part. "I made this today and put 4 oz each in a jar. Since the directions said it would make 8, 8 oz jars I knew I would get 16, 4 oz jars. However, I only was able to fill 9, 4 oz jars with a little left over. Why is this? I followed the directions exactly and have double and tripled checked! When I weigh it should I count the jar as part of the weight- I wouldn't think so. I didn't, and came out with the 9+ 4 oz in weight mechanics scrub. Thanks! " Staff Answer The 8oz jars in our recipe when filled have a weight of 5.6oz which would give you a total weight of 44.8oz. Based on this weight you should be able to get 9-11 4oz jars. "I have several customers who absolutely love this product, but they presented me with a question that I also became curious about: How can I reduce the thickness of the product so that I could place it in a container with a pump dispenser? A lot of our customers love the product, but would like to have a way to use it without having to put dirty hands in, and instead have some type of dispenser. Do you have any suggestions?" Staff Answer You can reduce the thickness by adding less of the pumice powder. But it will probably still be too thick to put through any type of pump. You might suggest to your customers to place some type of spoon or scoop next to the jar and use that when scooping out the product for hand washing. "What preservative is best used with the mechanics scrub? " Staff Answer We recommend either Phenonip or Optiphen Plus as preservatives for scrubs. "I am ordering the pumice but have the other ingredients except clear M&P. I do have white M&P. May I substitute white for clear in this recipe? Will it change the way the product looks? Thank you." Staff Answer Using white MP soap instead of Clear MP soap may produce a brighter white scrub but the product overall will perform the same. "I had most of the ingredients to make this and ordered what I didn't have on hand. I melted the MP as directed, however, I found that once I began to add the additional ingredients, the melt and pour began to solidify and I ended up with lumps in my finished product. I would like to make another batch, but before I do, could someone please advise how to keep the MP liquid so that I have a smooth batch instead of one with lumps. Thanks." Staff Answer If the soap starts to harden too much before mixing in all ingredients, it is okay to reheat soap again in the microwave. "Is a preservative needed or is there one already built into one of the listed kit ingredients? "